Published: June 19, 2014 at 05:09 p.m. Updated: June 19, 2014 at 05:49 p.m. Remember when 320 pounds was absolutely massive for a college lineman? It's still awfully big, but 340 is quickly becoming the new 320 when it comes to size up front in the college game. With a look at some of college football's biggest players in our latest installment of the "14 for '14" series, CFB 24/7 has compiled some real monsters, each of whom is either a returning starter from last year, or expected to start this fall. 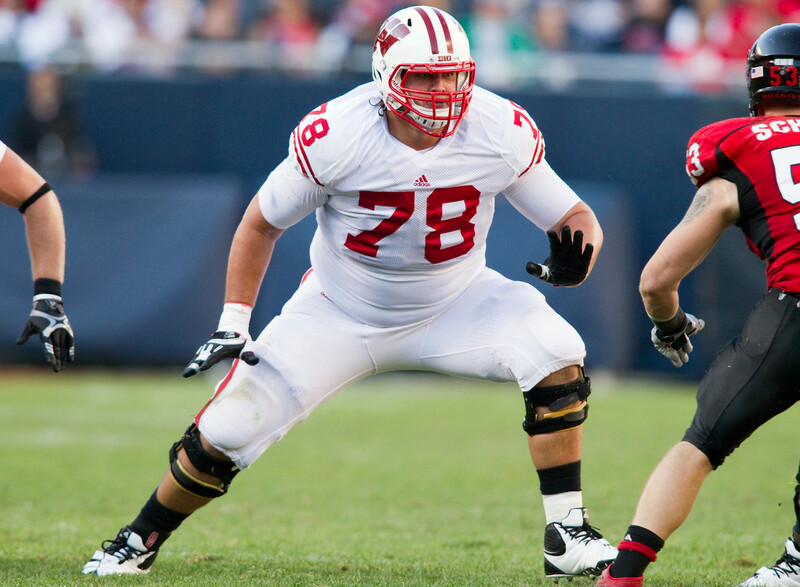 Buzz: In Havenstein, the Badgers return a third-year starter at right tackle who embodies the big, physical style of play Wisconsin's offensive front is known for. He was a second-team all-conference pick by Big Ten coaches last year and will make his 28th consecutive start when the Badgers take on LSU to open the season Aug. 30. "He works hard. He comes to practice every single day and works as hard as anybody in that group," said his position coach, T.J. Woods, prior to the Badgers' bowl game. "And I think he genuinely cares about being perfect and sharpening his sword and perfecting his craft." Buzz: The versatile Rotheram has started one season at guard and another at tackle for the Panthers. He's expected to be back at guard once again, and lead a Pitt line that needs much improvement as its most experienced member. The Panthers gave up 43 sacks, which ranked 118th out of 123 FBS schools. Buzz: While fellow defensive tackle Darius Philon will get more attention than Hodges this fall as the better pass rusher of the two, it will be Hodges doing more of the dirty work as a run stopper. He's got some big shoes to fill in former team leader Robert Thomas, who signed as an undrafted free agent with the Washington Redskins. But it's not as though he lacks experience -- Hodges made 27 tackles last season, 2.5 for losses, and knows how to hold his ground at the point of attack. Buzz: What says more about Alexander's size is that he's been able to start and play at a high level at two different positions in his first two years of college. The Tigers' starting right tackle as a true freshman in 2012, he moved to left guard last year and started every game. He led the team with 71 knockdown blocks last season while playing every snap in 10 of 13 games. After left tackle La'el Collins moves on to the NFL next year, don't be surprised if Alexander gets a look for the left tackle job in 2015. Buzz: Gray was at the top of the depth chart at left tackle going into spring practice, a sign that he might be ready to turn the corner as a starter in his final collegiate season. He's seen experience at both guard and tackle in his career, primarily as a backup, but has a few scattered starts to his credit, including one against UCLA in 2012. Buzz: Banner was once a highly sought-after recruit, but endured a rough start to his college career after a hip condition requiring surgery put his 2013 season on ice. By all accounts, however, he was impressive in spring practice and is poised to be a starting tackle for the Trojans this fall. Said new coach Steve Sarkisian: "He is a big man who is hard to run around, 6-foot-whatever he is, 350 some odd pounds. A lot of his future will center around his confidence continuing to grow. He's a very bright guy. He's physically gifted enough, it's just a matter of getting him knowing that he is capable of doing it." Buzz: The Gamecocks should have the best offensive line in the SEC East this year, if not the entire league (Texas A&M's will once again be stellar, but we digress ...), and Robinson is a major reason why. He'll be a third-year starter at left tackle, and while his footwork might still need some work, he is an extraordinarily physical drive blocker who can create a lot of open grass on the left side for star running back Mike Davis. The next crop of SEC offensive tackles destined to be NFL draft picks begins with A&M's Cedric Ogbuehi, but Robinson is definitely part of that conversation. Buzz: Brown will be a third-year starter this fall, entering the season with a full year of experience at left tackle and another (2012) at right tackle. There are some major differences in how things will be done on the offensive front under new coach Bobby Petrino, compared to the system under Charlie Strong. That'll be a challenge for Brown, but as a senior, one he'll be expected to overcome. He's also got a nice set of singing pipes -- not exactly Sinatra-quality -- but a lot better than the shower singer in your house. Buzz: Chandler returns this fall as the Wolfpack's starting right tackle. Bearing the same name as the New York Knicks center, who is one of the biggest players in the NBA, the Wolfpack's Chandler is about as big as it gets on the college gridiron. Chandler will be a third-year starter with nearly 2,000 career snaps of experience when the season begins. He'll be looking to lead improved protection of N.C. State quarterbacks, who were sacked 36 times last year (3.0 per game), more than all but 13 of 123 FBS teams. Buzz: What could have been a dominant year for Morris last season never even got started, as a torn ACL put him on the sideline in the Rebels' first game. He had been a full-time starter at guard in 2012, and even saw six starts as a freshman in 2011. Morris isn't just a big body -- he's a player -- and provides a physical presence to an offense known more for finesse than power. A healthy Morris in 2014 would be a major boost to the Ole Miss offensive front. Buzz: The massive junior-college transfer wasn't expected to get much playing time last year, until the injury bug began picking the UF offensive line apart piece by piece. Once he surfaced in the lineup, Brown made five starts at the right tackle spot. This fall, he'll be playing offensive guard when he's not blocking out the sun. He might not have seen the field in an offense that requires more athleticism up front, but for what Will Muschamp likes to do, the former Georgia Military College transfer has found a fitting home at Florida. Buzz: Atoe has just seven starts in his career, but one of them came in last year's bowl win over BYU, and he finished spring practice with an edge for a starting role. If he can finish the task and make it through fall camp with the Huskies' first-team offensive line, he'll be one of the most imposing-looking players in the Pac-12 this season. Buzz: After making just two tackles all of last season, Latu doesn't have the notoriety yet that his size demands. But he's obviously made an offseason move, as he showed up as a first-string nose guard on ASU's spring depth chart. Don't expect Latu to play much in third-down passing situations, unless a hurry-up offense prevents him from subbing out. But this fall, the early downs will be Mo Time at Sun Devil Stadium. Buzz: So how exactly did Baylor lose massive All-Big 12 offensive lineman Cyril Richardson to the NFL draft and get bigger at the guard position? The answer is LaQuan McGowan. He didn't start a game all season last year, but he surfaced as a starter on the Bears' spring depth chart. Given the pace at which Baylor's offense likes to snap the ball, McGowan could lose a few pounds just chasing after the Bears' first-down sticks this fall.